R/V Atlantic Explorer at the BIOS dock. BIOS has marine facilities at two locations in Bermuda, each with different resources and capabilities to serve a variety of needs. 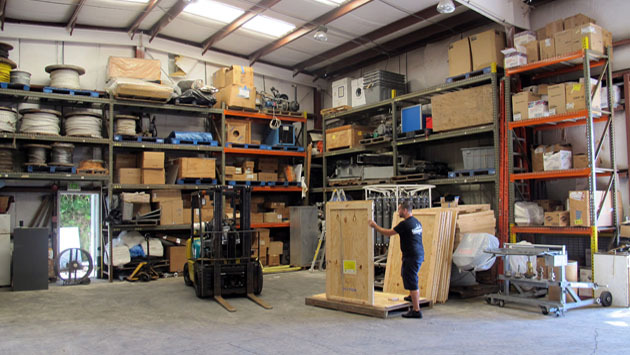 The 1,750 ft2 warehouse at BIOS is located adjacent to the waterfront, providing ready access for loading/offloading of scientific equipment. Temporary and transient storage before and after funded cruises is provided free of charge in most cases. Fees may be applied for additional time or long-term storage or bulky items. Inside and outside space is limited, so please plan well in advance. Please contact Marine Technical Services for all storage enquiries. The ship's crane is normally available to assist with loading. The outreach is 48' (capacity of 3,000 lbs) and the minimum load radius is 6.5' (capacity 11,000 lbs). Extra heavy loads may require commercial shore crane services, which the Marine Operations Office can assist in arranging. The R/V Atlantic Explorer will normally be loaded the day before departure and off-loaded on the day of return and the day after. When it is necessary to set up equipment prior to the day of departure, please check with Marine Technical Services in advance to coordinate operations. For personnel movement, BIOS can provide transport via the BIOS bus and a qualified driver, but charges will apply. Taxi, public bus, or mini-bus options are also available. You will need to make arrangements for accommodations ashore if you plan to arrive before your day of departure or stay beyond the day of return. Accommodations at BIOS should be requested and booked well in advance - at least 6 months is recommended. Please contact Jane Burrows, Housing and Reservations Manager, with requests for accommodations. If no accommodations are available at BIOS, contact the Marine Superintendant to see if it is possible to stay aboard the ship. 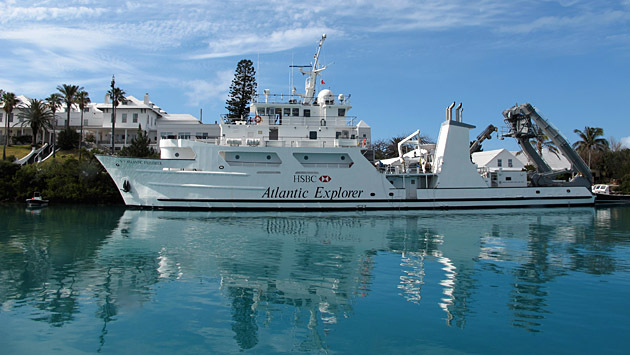 Accommodations aboard the R/V Atlantic Explorer for days other than awarded ship days are billed at the lowest room rate as outlined in the Visiting Scientist Fee Schedule and Information. The R/V Atlantic Explorer is usually at port alongside BIOS in Ferry Reach. There are certain operational restrictions placed on our transit by the Bermuda Pilot, for example, all transit must occur during daylight hours. We are also restricted to a small time period around high waters during which we may safely navigate the Ferry Reach channel to/from BIOS. If high waters occur after 1200 hrs on days of departure, or before 1200 hrs on days of arrival, it may be necessary to depart/arrive from Penno's Wharf in St. George's Harbor. This option is dependent upon dock space availability and operational logistics. We recommend that you include departure and arrival days in your planning by requesting enough Operational Days to allow for these transit restrictions. When loading must occur at Pennos Wharf, whether planned or unplanned, use of BIOS trucks may be required and fees will apply, to be borne by the CS/PI. For unplanned loadings/off-loadings at Penno's Whaf, the Marine Department will assist in organizing transport whenever possible.